The Witch of Endor: Kind or Cunning? We learn in 1 Samuel 28:6 that the Lord is no longer communicating with King Saul through dreams, the Urim (a divinatory device), or prophets. So he seeks out a “Mistress of the Spirits” even though he has abolished witchcraft and personally persecuted its practitioners. In disguise and under the cover of darkness, Saul searches out a particular witch who resides in Endor. He asks her to bring forth the spirit of the prophet Samuel that he might receive information about God’s will. Archeological remains confirm that pre-exilic Israelite culture included the worship of family ancestors. Though Samuel is not one of Saul’s ancestors, perhaps he felt a particular kinship with the prophet since he was the one to anoint him king. Another possibility is that the woman of Endor was herself a relative of Samuel. Saul spared her life and sought her out specifically because he knew she had special access to the prophet. With little difficulty, it seams, the medium raises the wrathful spirit of Samuel who prophesizes that the next day Saul and his sons will die in battle. (Ironically Samuel argues that God cannot be compelled to reveal the future but then gives Saul the knowledge of the future that he seeks.) For all the illicitness of the profession of necromancy, it is interesting that Saul, his attendants and the medium herself never doubt that she has actually raised Samuel’s spirit nor do they doubt the divine authority of the prophet’s pronouncement. This raises some interesting questions. Once the séance is completed, Saul collapsed on the floor as a result of dread and exhaustion. She quickly prepared bread and a freshly “sacrificed” calf and served it to the king. We see her behaving like Abraham welcoming the guests at his tent with a meal of meat and bread. Her actions also echo the role of the Temple priests with their meal offerings, shew bread and animal sacrifices.”In a world in which only men could enter into the priesthood and in which men dominated the prophetic guilds, it is likely that women used other forms of divination to access the divine realm” (Kamionkowski, p.715). Being a witch was an opportunity for women to have a religious role in ancient Israel. 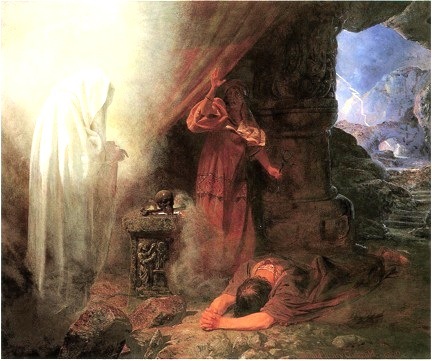 Some scholars propose that like other divinatory techniques, necromancy was so commonly practiced in the pre-exilic period of Israel’s history that it was not prohibited initially. They base this conjecture on the fact that it is not mentioned in the earliest laws of Exodus 22:22-23:33. By the time of the later Holiness Codes of law (Lev. 22-26; and Lev. 19:31; 20:6-27) the practice was fully discredited as the priests attempted to gain exclusive religious authority. Depicted as a gracious hostess, the storyteller’s sympathy is with the woman. Or is it? Pamela Reis argues that it is unrealistic to think that the terrified woman cares tenderly for the distraught king out of a sense of hospitality. After the séance, Saul no longer needs her powers and therefore he is potentially more dangerous. He might execute her to remove evidence of his hypocrisy. So she makes him a proposal. “Behold, your handmaid hearkened to your voice… Now you, too, listen to the voice of your maidservant. I will place before you a piece of bread so that you may eat, so that you may have strength when you go on your way” (vv.21-22). She wants him out of her house before he dies and she is implicated in his death. With subtlety, she compares her life to a morsel of bread, not to denigrate herself but to negotiate with Saul. “Because of her willingness to risk her life for him, she has acquired a sort of right to his life.” (Simon, p.165) To seal the deal, Reis argues that she offers him raw meat with blood and sacred bread as a covenantal meal. By eating, Saul is contractually obligated to safeguard her life. Are we seeing here a biblical respect for the kind of psychic powers the medium possesses? Or is the point of the story that King Saul’s depravity knew no bounds? It seems these readings are not mutually exclusive. Through the nuanced description of the witch we must ask ourselves what constitutes “proper” sources of divine communication. The story challenges us to ask ourselves how we can personally know the will of God. Reis, Pamela Tamarkin – “Eating the Blood: Saul and the Witch of Endor” in Journal for the Study of the Old Testament 73 (1997) 3-23. Simon, Uriel – “A Balanced Story: The Stern Prophet and the Kind Witch” Prooftexts 8 (1988) 164-65.